Like I said in my previous Giveaway - Comment2Win article, there are two contests on Marcofolio.net to help you out during the expensive holiday times. 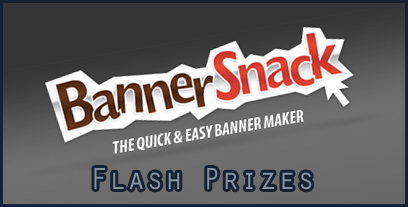 Today, we're starting the giveaway licenses of an awesome online Flash Banner creator: BannerSnack. Now I hear you: "What does this BannerSnack do?" To put it down simple: You can create Flash Banners online, very quick and easy! I've had a chance to play around with the tool and I must say, I'm really impressed. Take a look at the following example that I made in under 30 minutes: Try to beat that with Flash Pro (Have to admit that I got the source files from my own 20th Birthday Invitation). Impressive, right? I think so! You want a chance of winning? It's pretty simple: Just leave a comment and make a chance to win! I'm able to give away five 1 Year Premium Plus packages worth $149 each. That's surely worth a shot! The contest ends on January 3rd 2009 00:00 CET (That's a great start of the year!). All comments submitted after that date don't count for the contest. Please leave your actual e-mail address in the comments so I can contact you if you won a prize.